Inder Loves Folk Art: First day of Class (Picnic). Hello everyone! I skipped August on this blog! Ugh! I've been having some issues with sew-jo lately, with too many WIPs and a fabric stash that is weighing me down instead of inspiring me. It's no good when your hobby becomes an obligation, know what I mean? And the hot weather definitely hasn't helped. I am trying to get back into it, knock off some of those WIPs, and get my inspiration back. Although I haven't been sewing as much, it has been a great summer. I've been learning string figures, spending lots of time gardening, and we all really enjoyed the kid's summer break this year. This blouse has been a long time in the making, at least mentally. I've wanted to make another gingham Class Picnic blouse for Maggie for a couple of years. I've made her three Class Picnic blouses over the years, and two of them were gingham, also with piping (here and here - look at baby Maggie!). This pattern SCREAMS to be made in gingham, I say. I picked up this lovely, very lightweight cotton gingham a year or so ago, I can't remember where - maybe Britex? It is such lovely, soft stuff. I'm sure I had this blouse in mind. But I've also been plotting something else for several years - a gingham blouse with chicken scratch embroidery. Chicken scratch is a type of embroidery that is traditionally worked over gingham. It's also called gingham lace because, when it's worked in all white, it looks very lacy. I got totally obsessed with chicken scratch a year or two ago; I'm not sure what started it, but it took over my apron and handwork Pinterest boards! Chicken scratch was popular during the Depression and the 40s, and was frequently used to decorate gingham aprons. It is a counted-stitched embroidery (like cross stitch), worked over the natural grid formed by yarn-dyed gingham. My specific inspiration for this blouse was this gorgeous Class Picnic blouse made by Spicy Jellybean Kids (check out her blog! it doesn't seem to be kept up, but her sewing is gorgeous! ETA: Find her at @spicyjellybeankids on IG!) I've been thinking about that blouse for a long time! I chose a different design for Maggie's blouse: pink and green flowers over a field of white "stars." 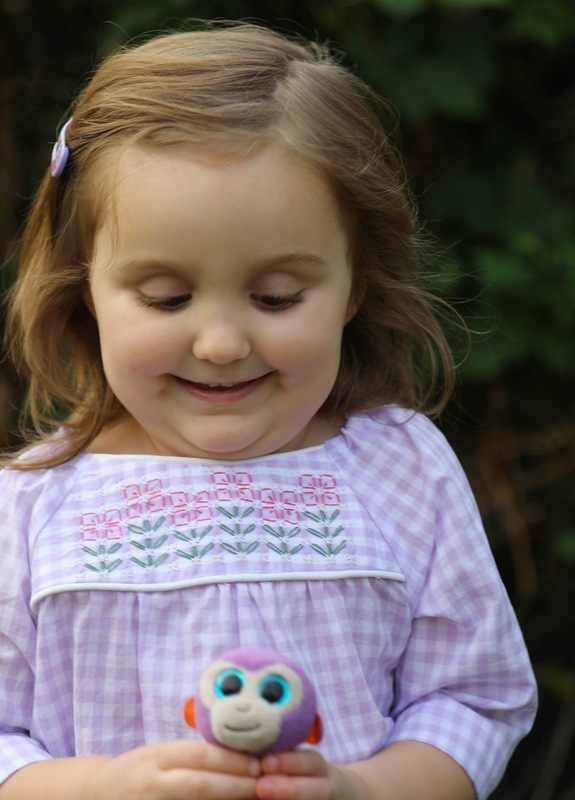 I copied the pattern from this pin, and I knew the pink flowers would help Maggie to accept the non-pinkness of the fabric. The stars actually hold the flowers. This is a really fun (and fast!) type of embroidery to stitch, and the embroidery took a leisurely day or two to work. I applied some woven interfacing to the back of the embroidery in hopes that it would make it a little sturdier, and the white piping further stabilizes the yoke. My experience with the Class Picnic blouse is that the front neckline can get saggy because it's partially on the bias (worse if you put the actual yoke fabric on the bias, as I did with my prior gingham Class Picnic blouses. A little bit of piping and perhaps a woven lining or twill tape stabilizes that gentle curve. 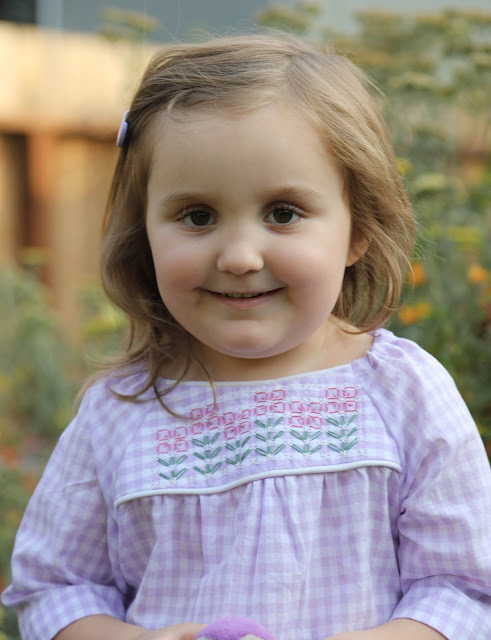 This is a size 3T, with no changes or alterations, on (tiny) five year old Maggie. I like that this top has some extra length and will hopefully fit for a while yet. The end result is sweet - yes, a bit twee - and I love it! The great thing about the Class Picnic is that it's really a sweet little peasant top, but with just a little bit of structure. It is one of my favorite Oliver + S patterns, for sure. With the pattern out, I couldn't resist tracing and cutting out some Class Picnic shorts to coordinate. I've seen several versions of these on blogs and Instagram this summer in all one fabric, and I was reminded how much I love this pattern. So I quickly whipped up a pair in Robert Kaufman union chambray. In size 3T, this pattern takes less than a half yard of fabric, I think. I love it! I added a pink ribbon bow as decoration (again, everything needs some pink!) and to help Maggie tell the front from the back when dressing. Full disclosure: Maggie was initially disappointed that these shorts don't have pockets, but she seems to have gotten over it now. Maggie started her last year of preschool today and had a great day! Both of my kids are back in school now, but I refuse to let go of summer until at least the autumn equinox! My garden is pumping out tomatoes and cucumbers with no end in sight, and September tends to be one of our best months for warm weather. So I predict these warm-weather clothes will get a bit more wear before they're put away for the winter. I hope I can find the time to make her these blouses every year, because I love this pattern! Are you still sewing summer things? Is your fabric stash getting you down? Dish. It's a great outfit, and the embroidery is a perfect compliment. I don't embroider often, but I find it so soothing. Maybe I need to start another cross-stitch! You have outdone yourself! Maggie is just adorable in this gorgeous outfit. Maggie is divine and I love this outfit. Sewing is my job, so I approach it like that. I keep my sewing room very tidy and have my apples and water bottles and Hugo bought me a chrome cast so now I can watch grown up telly with the door shut, once the girls get home from school to watch Trixie. However, I hear you, I have polar fleece to make Elsa some more jackets and I Can't Get Motivated to sew them up. Did I say how cute Magge is? Oh, I love it Inder! Just keep on taking advantage of the opportunity for sweet-bordering-on-twee while you can! I've a feeling that at nearly ten, Clem's just on the verge of being over novelty print clothing so I might bust out some shorts-with-lions or something this summer while I still can. As for the fabric stashing, since having the shop Fiona and I have become much better at not stashing. I guess it's like going to work in a giant stash :D but also it has taught us that 'there will always be more beautiful fabric'. It's a bit of a motto now. At first we would grab a bit of this and that before it all sold, and then new pretties would catch out eye and we'd make something up in them rather than from the stash. So if I can pass on any wisdom it is that little motto. And it's not a bargain if it just sits in your stash... (to say the annoying, obvious thing, I hate advice like that, haha). Maybe you owe it to yourself and your sewjo to donate a heap of stuff and have a bit of a fresh start? I cannot agree enough with Jane. I have been given a lot of fabric, which I am very grateful for, don't get me wrong but now I sew it, plan it or donate it. Yes! I do the same thing! This outfit is so cute, Inder! I don't have these patterns and I think I really need to change that! 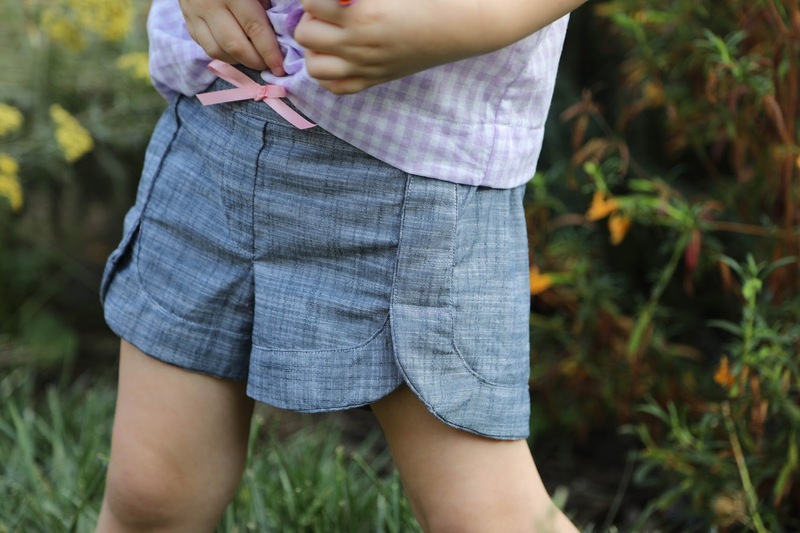 The shorts are so adorable with the curved hem. I want some like that for myself! 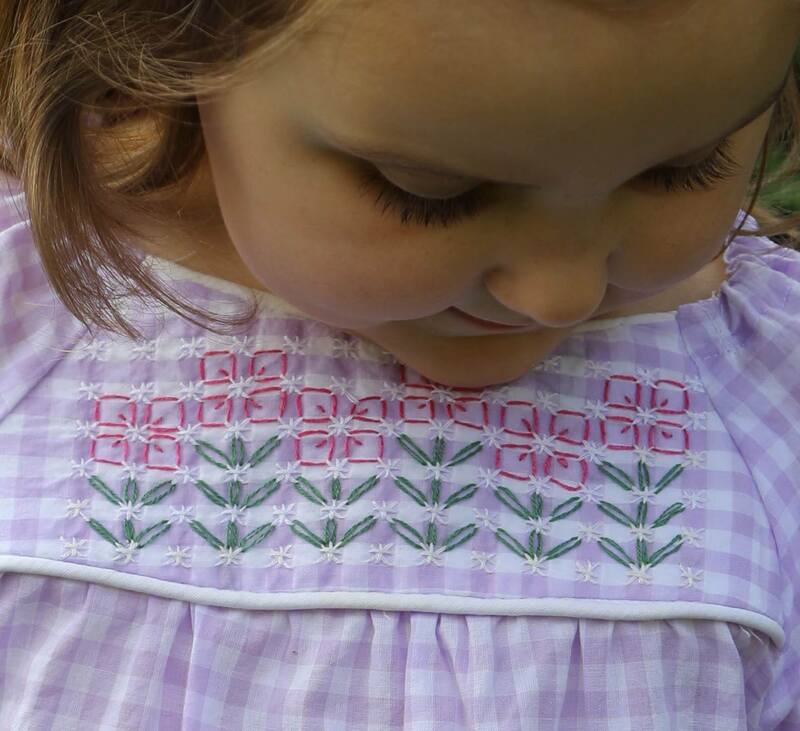 I love the embroidery that you did on the yoke of the top. What a sweet, special detail. I hope that Maggie gets lots of comments on it when she wears it so she can say her mom made it! Seriously, I can't stand how adorable she is! I love the whole outfit. I love it, Inder! I love how your style is so uniquely you. Maybe the fall/winter will bring with it some sewing vibes? 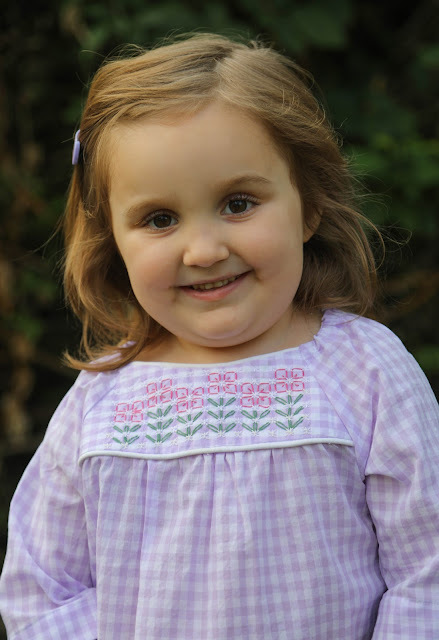 My sewjo was waning this summer, but now that our temperatures are dropping a bit I am inspired to sew for fall!